Handmade Bird, Bee, and Bat Houses features homes to build for everything from bees to bats, and bluebirds to butterflies. Each house is beautifully designed, with colorful details, but is also perfectly adapted for its intended inhabitants. There are birdhouses you can hang up or place on stands, a bee house you can “plant” in your flowerbed, and there's even a home for a toad. There are also feeders for birds and butterflies, and homes for ladybugs. With her trademark attention to detail, Michele McKee-Orsini has designed a collection of miniature palaces for the wildlife that we should all be encouraging into our backyards. Michele takes you through the basic woodworking and decorating skills you will need, and the step-by-step project instructions, clear artwork, and stunning photography will all inspire you to build your own bird, bee, and bat houses. Michele McKee Orsini is an artist and wildlife enthusiast who loves nothing more than walking through the woods looking for unusual pieces of wood to turn into houses for birds, bees, and bats. She now makes and sells a stunning range of such houses, always with the creature's needs foremost. 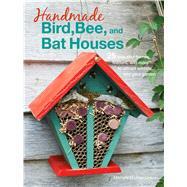 This is her second book—she is also the author of Handmade Birdhouses and Feeders, published by CICO Books. Find her at www.etsy.com/shop/birdhousesbymichele. She is based in Yucaipa, California.